We all know we should limit sugar intake. But particularly so when it comes to our kids. That’s because sugar encourages tooth decay. How? Well, bacteria in our mouths feed on sugars in the foods we eat. Those bacteria then produce acid that eats away at our teeth. Here are a few tips that may help in curbing your kids’ chances of experiencing tooth decay from the wrong kind of snacks. The U.S. Food and Drug Administration recommends that people age three and older should consume no more than 12.5 teaspoons each day of added sugar. (The same as one can of soda.) The World Health Organization states that adults should consume no more than six teaspoons of added sugar, and children should have no more than three. Because juice is high in sugar and calories, water and milk are always the best options for kids. In fact, if your child is under one, the American Academy of Pediatrics suggests completely removing juice from his or her diet. Allowing your child to sip on juice throughout the day puts him or her at higher risk for tooth decay because you’re giving that cavity-causing bacteria more opportunities to eat and produce the acid that eats away at teeth. This can also happen with juice that is watered down. So be sure to limit the amount of juice your children drink, and always offer water or milk first. If your child does drink juice, serve the recommended, age-appropriate limits at mealtimes only. When your family is done eating, clean up any leftover juice instead of letting your children leave the table with it. These sugary, carbonated beverages are bad news for your child’s teeth. In fact, just one can of soda is the amount of sugar recommended for three days for a child. Kids love crackers and chips. But serve with care. Not only do the carbohydrates in things like crackers and chips break down into sugar, they also tend to get stuck in the tops of their teeth for long periods of time. 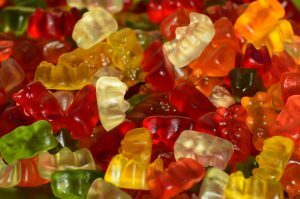 Some parents believe that gummy or sticky fruit snacks are healthy alternatives to candy. But many parents are surprised to learn they are really closer to candy than fruit, especially when it comes to sugar. Fruit rollups and other dried fruit snacks are in some respect worse than candy because they can stick to teeth longer than things like milk chocolate, which is easier to wash away. Of course, always make sure your kids’ teeth are as healthy as they can be. Make and keep your appointments with the professionals at Longmeadow Family Dental Care.